Private murals and public installations are turning the outdoors into a gallery. What’s behind the explosion of public art? We’ve been hearing two things about Los Angeles in recent years. It’s fast-becoming an art capital. And it’s embracing public space, with new parks, public transit, a reclaimed river and more. But are the two connected? Because if you drive, walk or take the train right now you will see a lot of art. 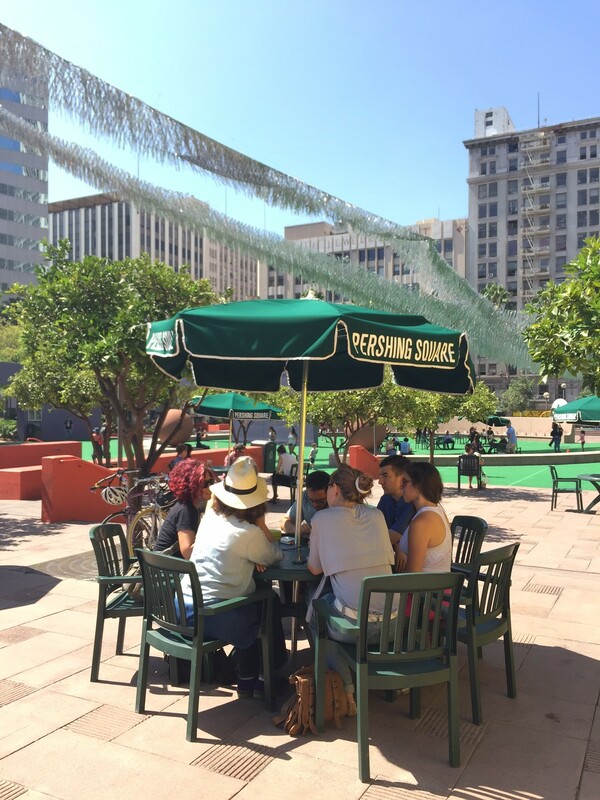 Our art critics debate LA’s public art explosion in Pershing Square (photo by Amanda Sutton). The list includes: the recent Current LA: Water public art biennial that put conceptual art installations relating to the theme of water, in far-flung corners of the city; Liquid Shard, the floaty tinselly wing suspended over Pershing Square by Patrick Shearn that drew crowds to the unloved park; artworks at each station on the new Gold Line and Expo Line Extensions; and a bumper crop of new murals across the region. But the aggregate is a lot of stuff to see outside, beyond Pokémon GO characters. So why all this art and what should you go see? DnA sat down with a group of professional art-watchers, including Carolina Miranda, Lizy Dastin, Shana Nys Dambrot, Matt Stromberg and Catherine Wagley. Carolina Miranda recommended La Sombra (The Shade) by Teresa Margolles, which dominated a corner of Echo Park Lake as part of the Current LA: Water public art biennial. Lizy Dastin said she would take visitors on tours of permitted and what she calls “self-sanctioned” murals and street art in the downtown Arts District or in Santa Monica. “I think that there’s some really exciting voices artistically manifesting right now,” she said, such as muralists Christina Angelina and Mikael Brandrup, street artist Thrashbird and “Angel Wings” painter Colette Miller. 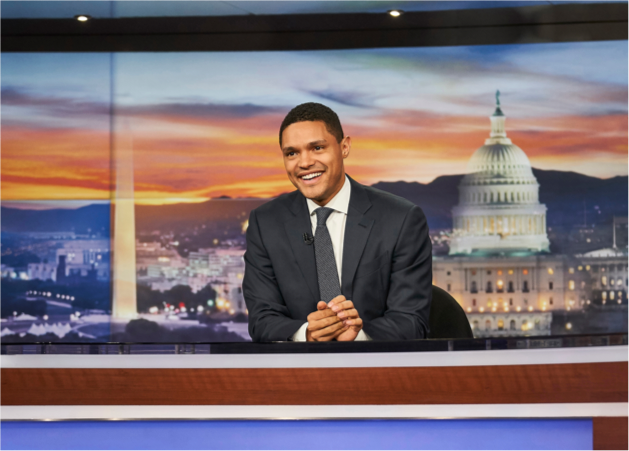 “Even though they physically are showing outside of a traditional institutional space of a museum or gallery, I think that the content and the purpose and the anarchy and the spirit are just as significant,” Dastin said. Catherine Wagley recently took her mother to see Michael Heizer’s Levitated Mass at LACMA. Her mother had followed the procession of the rock from its quarry to Los Angeles. “She just wanted to see what it was like as a finished thing,” she said. Besides her enjoyment of riding the train and exploring different parts of the city, Shana Nys Dambrot appreciates Metro’s public art program. “And so it’s not just the wonderment of being able to take the train to the beach, it’s along the way leaning out every single window, being able to see a really diverse selection of the work of contemporary visual artists at each station,” she said. Judithe Hernandez at the downtown Santa Monica Metro station, which features her “LA Sonata” artwork. Photo by Avishay Artsy. 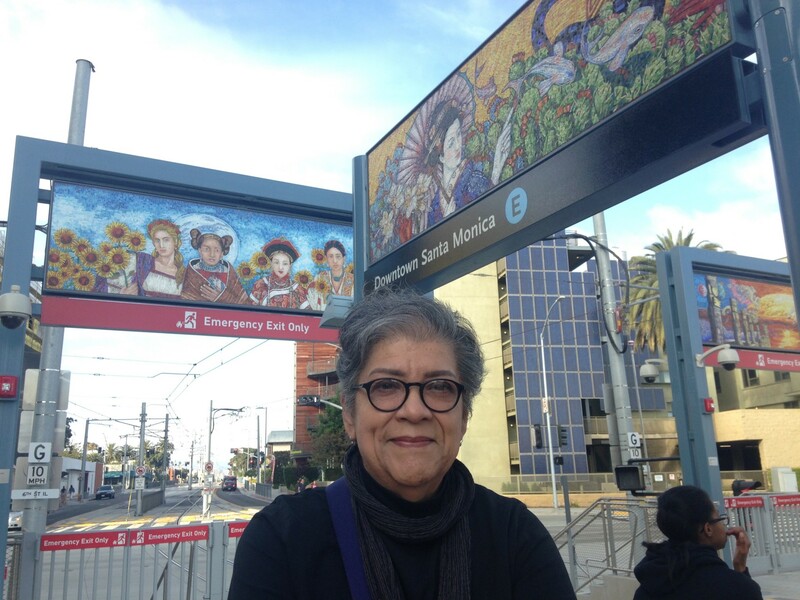 DnA also spoke to Chicano artist and muralist Judithe Hernandez, whose art graces the Expo Line terminus in downtown Santa Monica. For her series of glass mosaic panels entitled LA Sonata, “I decided to take every iconic cultural image I could find that was appropriate and weave them into a tapestry of Los Angeles, the remarkable diversity that is here,” she said. She borrowed from classical iconography and mythological figures from Korean Japanese, Chinese, Mexican and other cultures. We also asked her about whether the political nature of outdoor art has fallen by the wayside. That’s not entirely fair, remarked Lizy Dastin, citing the piece by Plastic Jesus “where he constructed a six inch wall around Donald Trump’s star,” which went viral as one of “countless” politically charged murals.